Accompanied by GDA President Russ Gittlen, GDA board member J. Weldon Granger speaks during the July 29 dedication of the Fran Granger Auditorium on GDA’s Campus. More than 350 guests joined Guide Dogs of America (GDA) President Russell A. Gittlen July 29 for the dedication of the Fran Granger Auditorium on the school’s campus in Sylmar, Calif.
Named in memory of GDA board member J. Weldon Granger’s beloved wife of 46 years, the auditorium is located at the heart of GDA’s visitor and education center. Mr. Gittlen welcomed Mr. Granger and the couple’s children, Jennifer Granger Blankenship, John Granger, and Jason Granger to the auditorium’s stage to accept a plaque honoring their family’s generous support. 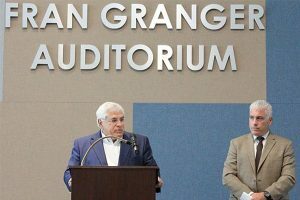 Mr. Granger’s $250,000 gift to name the auditorium is the most recent example of his family’s dedication to GDA’s mission to provide blind and visually impaired individuals with guide dogs and instruction in their use, free of charge. Mr. Granger and the couple’s sons have served the International Association of Machinists and Aerospace Worker all of their professional lives and Mrs. Granger was deeply committed to GDA, as well as several charitable organizations in her Houston, Texas community and beyond. Mrs. Granger died in 2016 at the age of 67. At the time of her passing, Mr. Granger shared that his wife’s courageous battle with cancer exemplified her unwavering strength and strong Catholic faith, and that her unselfish approach to life made her a wonderful wife, mother, grandmother, sister, aunt and friend. The graduation ceremony of GDA’s Class 399 immediately followed the dedication. The class includes 10 teams of blind and visually impaired individuals and their new guide dogs. Students in the class range in age from 22 to 70-years, and range in experience from a first-time guide dog user to a student graduating with her 15th guide dog. GDA board member Lorri Bernson has received two guide dogs through GDA’s program. Mrs. Granger was known to shy away from fanfare. 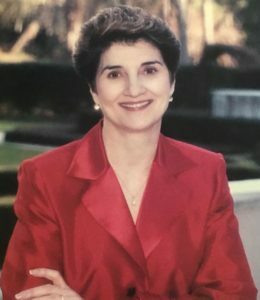 While she truly “gave to give,” without the need for notice, she would be incredibly touched to know there is a forever memory in her honor on the campus of GDA, Ms. Bernson said. “We will always remember her and her warmth will fill the auditorium each time we gather here,” said Bernson. Six graduations are held annually in the Fran Granger Auditorium. The public is welcomed to the celebrations of the guide dog teams and the volunteers, sponsors and staff who make the life-changing partnerships possible. Visit the Graduation Ceremonies page for the schedule and details. Founded in 1948 by Joseph Jones, Sr., a retired Machinist, GDA has graduated more than 3,300 guide dog teams. It costs GDA $48,000 to breed, raise and train one guide dog and train each individual and guide dog to work together as a team. All services are provided at no charge to the recipient. A 501(c)(3) nonprofit charitable organization, GDA receives no funding from government agencies. All donations come from caring individuals, businesses, foundations, clubs and organizations, as well as through wills and naming opportunities.